Beachbody August Promotion on Focus T25 and 10-Minute Trainer Challenge Packs! Beachbody continues the tradition of monthly promotion to give you the best of health and fitness and this August, you can transform your life with Challenge Packs on discounts. You can get fit, attain complete health and save big bucks by availing Beachbody August Promotion on Focus T25 and 10-Minute Trainer Challenge Packs. If you are looking for a workout that offers awesome results in very little time, then T25 Challenge Pack discounted is for you. For the month of August, you can get T25 Challenge Pack for just $180 (original price=$205). Shaun T assures that T25 will give you the same kind of results that you will get from any hour-long workout program. Through T25 Challenge Pack you will be focusing on the intensity for 25 minutes for 5 days a week. This amazing offer comes with your favourite Shakeology health shake and 24/7 support. Grab this opportunity to shape your body from head to toe! No matter how busy you are, you can always find the time to squeeze in 10-minute workouts in your daily routine. Ain’t that right? 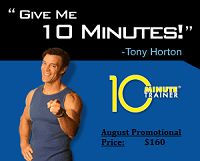 Keeping this idea in mind, Tony Horton (Beachbody Star Trainer) came up with this 10-Minute Trainer Challenge Pack that everyone should try to keep fit and healthy. With these breakthrough workouts and easy-to-follow eating plan, you’ll lose weight, get toned, and have plenty of time left over. In the month of August, you can get 10-minute challenge pack in just $160. This means that you will save $20 and above all you will save a lot of time for yourself. So what are you waiting for? Click below to avail the Beachbody August Promotion!